In this article, we’ll walk through developing a set of test scripts for front-end applications quickly and effortlessly using Nightwatch. This blog helps you to set up Nightwatch.js by understanding the required files and folder structure, the ins and outs of configuration files, and how to write and run tests both locally and in a cloud-based environment such as Sauce Labs. How Is Nightwatch Skeleton Going to Help? Before getting into the code and learning how to develop tests using Nightwatch.js, it's worth understanding the nightwatch-skeleton folder structure and configuration. In this post, we’re going to dive into some very specific configurations and custom commands, but most importantly, this post will demonstrate how the nightwatch-skeleton allows testers to come up to speed faster with less worry about the configuration and the standard burden. The custom-commands folder contains a list of custom helpers to increase your testing capabilities and reusability. nightwatch.json is a configuration file which tells the Nightwatch tool where to find the stand-alone Selenium binary, browser drivers, location of the test, environment profile, and more. 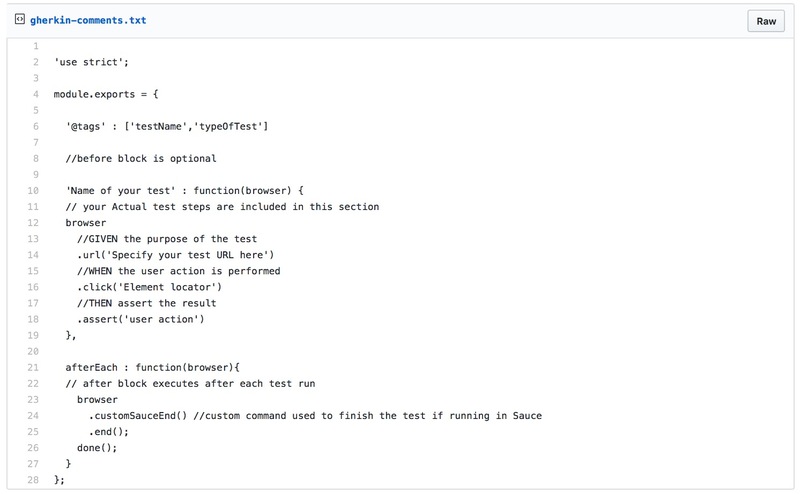 The ci/functional-test.Jenkinsfile file is a template to help quickly add your functional tests to the Jenkins pipeline. The configuration is the heart and soul of a Nightwatch test project. Setting up any test automation project can be tricky and confusing, with weak documentation. 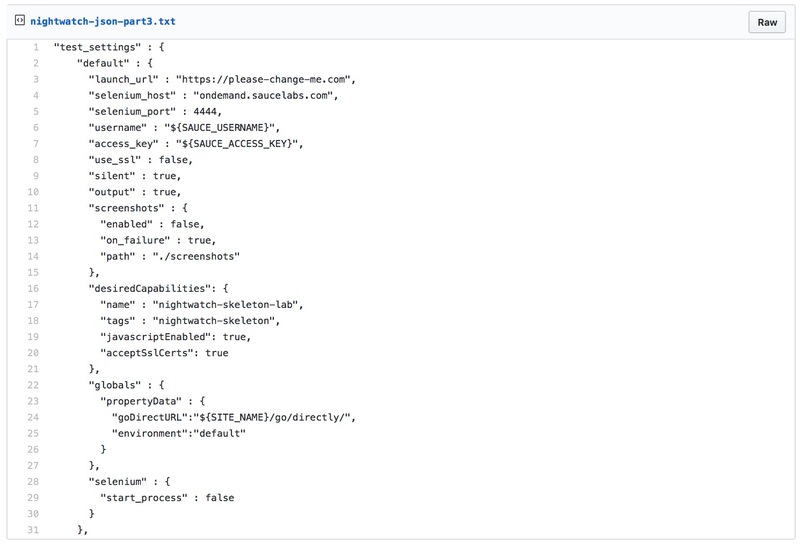 Let's take a closer look at the configuration file and highlight some important lines of code, looking at nightwatch.json below. LINES 10-12 The test_workers set to true allows for the running of individual tests in parallel, and for setting the number of workers to auto or a number. WARNING: If the number of workers is set higher than the number of CPUs where the tests are running in parallel, you will experience random test failures. LINE 3 is the location of the stand-alone Selenium binary. This requires that the start_process = true. LINES 7-10 - A list of CLI arguments passed to the Selenium process (where to set browser drivers for local execution). The default test_settings will be passed to the Nightwatch instance, but environment profile settings could overwrite specific default test_settings during runtime. LINE 29 Here, we set stand-alone Selenium as false and control this property from the environment profile. We default to executing all tests on Sauce Labs over running them locally. The local-chrome profile is necessary while developing tests. The developer can leverage the reduced system latency to accelerate testing. The settings allow the Selenium server to run locally and use local resources (browsers, platforms and associated drivers) to perform the test. 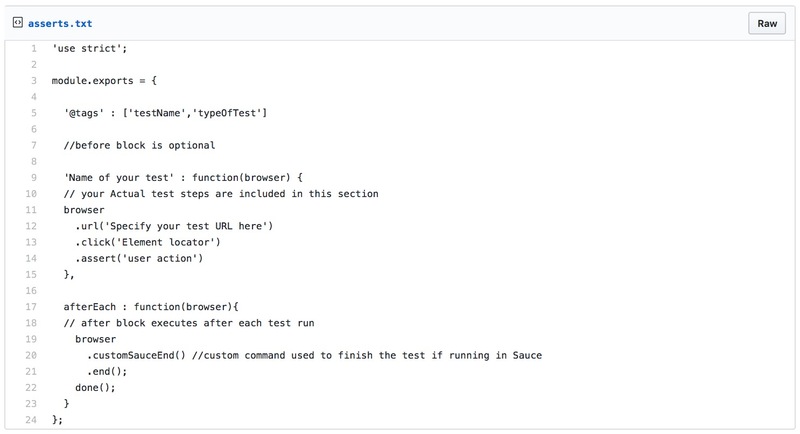 To build your own test profiles for Sauce Labs, go to Sauce Labs’ Platform Configurator to find the capabilities needed for Sauce Labs. You can find all the above code snippets at: gist.github.com/gsypolt/nightwatch-code-snippets or https://github.com/gsypolt/nighwatch-skeleton. Before and After test hooks - LINE 5 and LINE 14. Tags - Test can have multiple tags to groups the tests (keep them meaningful) - LINE 6. In general, most of the tests do a user action (which is usually a .click action). At least one .assert statement should be included - LINE 14. Include GIVEN WHEN THEN comment statements to explain what the test does and its readability - LINES 13, 15, and 17. The perform blocks are used to synchronize the test steps, as Nightwatch.js is asynchronous in nature. (We use the perform blocks over explicit waits) - LINES 15 and 19. So far, you have learned how to get started by cloning my nightwatch-skeleton and downloading and installing project dependencies, and you’ve learned additional information about how to configure and tune Nightwatch.js. 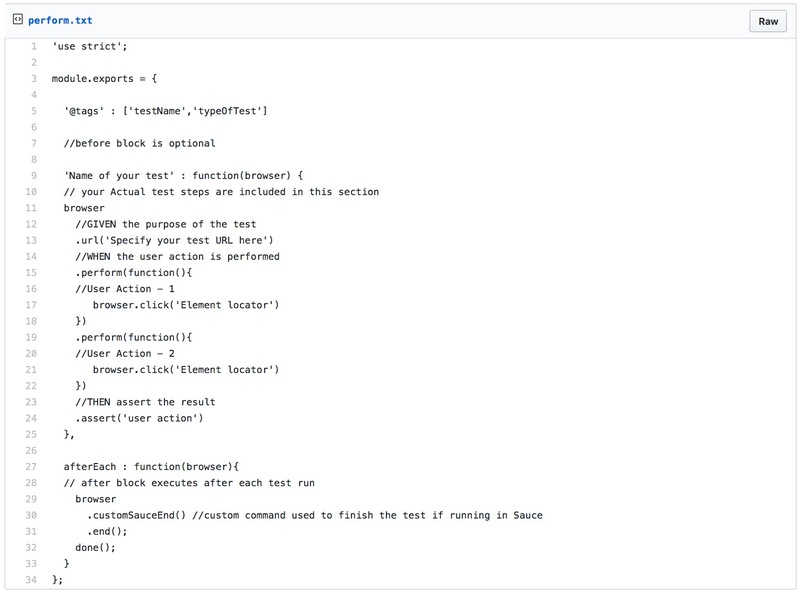 I only briefly covered how to write tests, but with these steps, you have all the necessary tools to create tests and run them locally or remotely. Where should I run tests? On staging? On production? When do I build my test pipeline? In closing, a lot of the credit for the nightwatch-skeleton implementation came from my amazing Quality Engineering team at Gannett | USA Today Network, with me spearheading the design.